Baby is almost 16 inches tall and weighs around 2.5lb. Babies wrinkles are starting to disappear as he packs on the healthy fat he needs. Baby is starting to have a sleep cycle and can even have dreams, he also is coughing and practising breathing ready for life on the outside. So my Midwife came over on Thursday, my blood pressure was fine, urine was fine, babies heartbeat was all good. 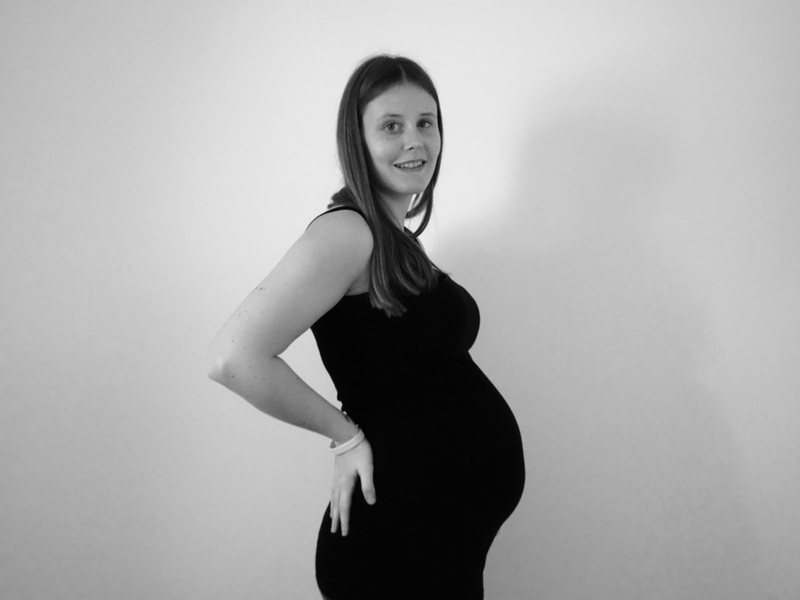 She measured my bump for the first time and it was measuring at 25 weeks, at the moment we aren't too concerned but will see what happens at my next appointment in 3 weeks time and how its measuring then. I said I had noticed babies movements had been a bit quiet and not the same the last 3 days so she got another midwife to come over with the monitor and she monitored me at home, after 22 minutes on the machine it was happy with its readings. She took some blood work and scheduled to come and see me again tomorrow to give me my anti - D injection. I also need to ring the doctors to get my whooping cough injection booked in. I've gained 4lb so far. I had a visual disturbance this week, it felt like something was flashing or spinning in my right eye, I also had a slight headache. After an hour it went away thankfully but I think I had been over doing it and that's why. Ive also had the dreaded constipation this week which hasn't been pleasant! My SPD is definitely getting worse and I think the awful sciatica is also starting to make an appearance.. ouch! I have some new stretch marks on my legs just under my knees at the side, it seems my legs seem to be growing but my belly not so much! Sleep hasn't been to bad, most nights I will only wake up once for a wee. I'm not finding it to uncomfortable just yet. Its been all about the chocolate milkshakes this week! I'm feeling ok, I have a lot of other stuff on my mind that I don't really have much time to think about myself at the moment. We still need to start buying bits and getting prepared for baby but think we are going to start that in March, I honestly haven't seen the rush to start buying bits this time as we have hardly anywhere to store bits until they need to be used so it makes sense. I'm missing being able to bend over and put my shoes on without the top of my ribs hurting me. Ive been living in my leggings as always, I should really buy some more as I seem to be wearing them to death! Getting my hair cut! You'll probably notice in my photo but I had 10 inches off my hair! It feels so good and means I can wash and dry my hair so much quicker and easier now. I also wanted it shorter for birth and breast feeding, but knowing how my hair grows I will most likely need another trim before D day. Isla has only 4 days at school this week before she breaks up for half term, I'm so badly needing a break from the school runs now as my SPD hurts so bad after the morning drop off and throughout the day it gets worse.